If you're in the mood for a new photo app to play with on your iPhone, you may want to take a look at Wood Camera - Vintage Photo Editor. Currently on sale in the iTunes App Store for 99 cents, Wood Camera provides an array of imaging tools to capture, edit, and share your pictures. The app features 32 lenses, which you'll recognize as filters similar to those found on Instagram and Flickr. You can capture with a filter turned on, or apply the effects afterward while editing. A nice touch is the ability to control the intensity of the lens via a slider. There are lots of other tools too, such as brightness, contrast, sharpen, saturation, hue, cropping, frames, and effects. Plenty here to keep you busy while waiting in line for coffee at Starbucks. Once you have the image to your liking, you can save to your Camera Roll or post online to Instagram, Facebook, Flickr, and Twitter. I had good luck posting to Instagram, but wasn't as successful sharing to Facebook and Flickr. Maybe the network gods were against me at the moment. The quality of the output from Wood Camera seems somewhere in between Instagram and Flickr. OK on the iPhone, but not as good as Flickr when examined on a computer screen. All in all, though, Wood Camera is a blast to play with and a great deal at 99 cents. You might want to see what you can create with it. Top stories this week on The Digital Story: Five things you can do when you want a new camera, but can't afford one; The Lomography Smartphone Film Scanner; workshops update. Story #1 - No New Camera! - I talk about 5 things that you can do to protect your credit card when a new, and expensive camera gets under your skin. Story #2 - The Lomography Smartphone Film Scanner - This is not the solution for the thousands of negatives you have shoeboxed in the closet. But for digitizing a favorite image every now then, this is a cool device. Story #3 Workshop reservation forms for the June workshop, "Movie Making for Photographers," are going out this week. 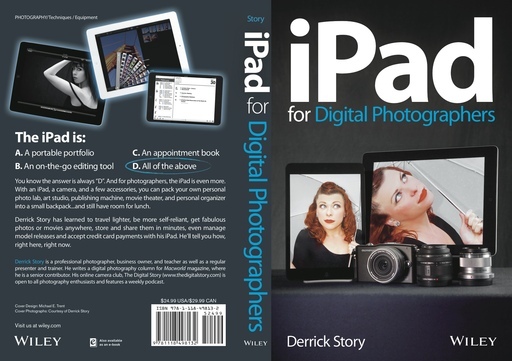 The April workshop, "iPad for Digital Photographers," has only one slot open. You can also download the podcast here (30 minutes). Or better yet, subscribe to the podcast in iTunes. You can support this podcast by purchasing the TDS iPhone App for only $2.99 from the Apple App Store. The February 2013 photo assignment is Furry Friends. Photographer James Duncan Davidson has been carrying the Sony RX1 since the early days of its release and has published his findings in the article, Sony DSC-RX1 Review. 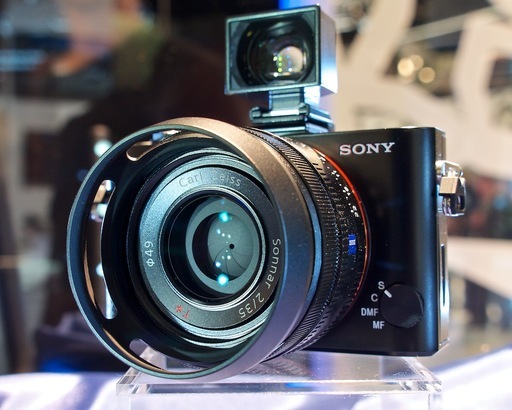 Sony RX1 with optical viewfinder photographed at Photokina by Derrick Story. A few things to note about Duncan's review. First, he's a working photographer who travels a great deal. So his perspective is very fitting for a full-frame sensor camera that fits in your jacket pocket. Also, if you have a Retina Display Mac, the sample images in his post take advantage of the pixel density of those laptops, and they are absolutely beautiful. The Sony RX1 lists for $2,800, so it's not an impulse buy. But after reading Duncan's review and enjoying the pictures captured with it, you might find it a bit harder to resist. We're just about finished with the cover design for iPad for Digital Photographers, and I thought you might enjoy the "inside story" about the model who graces the front cover. Her name is Lovely LadyJ. This was my first shoot with her. (I'm hoping she will be available for the TDS workshop in April.) Those portraits of her holding a photo umbrella were captured at Schulz Museum, across the street from the TDS headquarters. I liked how Lovely LadyJ had prepared her hair and makeup on that rainy day she showed up at the front steps of the studio. After we finished the first series of photos inside the portrait room, I asked if she would be OK posing for a second series outside, even though the conditions were a bit challenging. She loved the idea. By using the photo umbrella to protect her from the rain, it also served as a light diffuser and white background. I set the Olympus OM-D E-M5 to ISO 800 and mounted the Olympus 60mm f/2.8 portrait/macro lens on the body. We shot in the rain for about 20 minutes, then dashed back to the studio. When it came time for me to create the front cover image for the book, I loaded Lovely LadyJ's portraits on an iPad and an iPad mini. I set the devices on stands in the studio with an Olympus Pen mini and a few lenses, then shot the set live. In other words, the images were not "dropped on to the iPads" in post. What you see is how I shot it. I sent the cover image to Wiley Publishing, and designer Michael E. Trent took it from there. My philosophy is to "walk the talk" with this book. I've written big chunks of it in Pages on an iPad, and shot most of the images with an iPhone or micro four thirds camera. If I can't do it in real life, it doesn't go in the book. iPad for Digital Photographers, is scheduled for release on May 7, 2013. I'll have more behind the scenes anecdotes to share between now and then. Here's an ode to the Super Bowl Chrysler ad, "Farmer," created by the Richards Group. But this time the subject is "photographer." I enjoyed this. Hope you do too. In an attempt not to undermine the sales of its popular EOS 5D Mark III, Canon may have constrained the features a bit too much on the promising EOS 6D. At least that's the viewpoint of DP Review in their test of the 6D DSLR. Even though you get built-in WiFi and GPS, which they like, they were unimpressed with the 11-point autofocus array, slow burst rate, and average video performance. 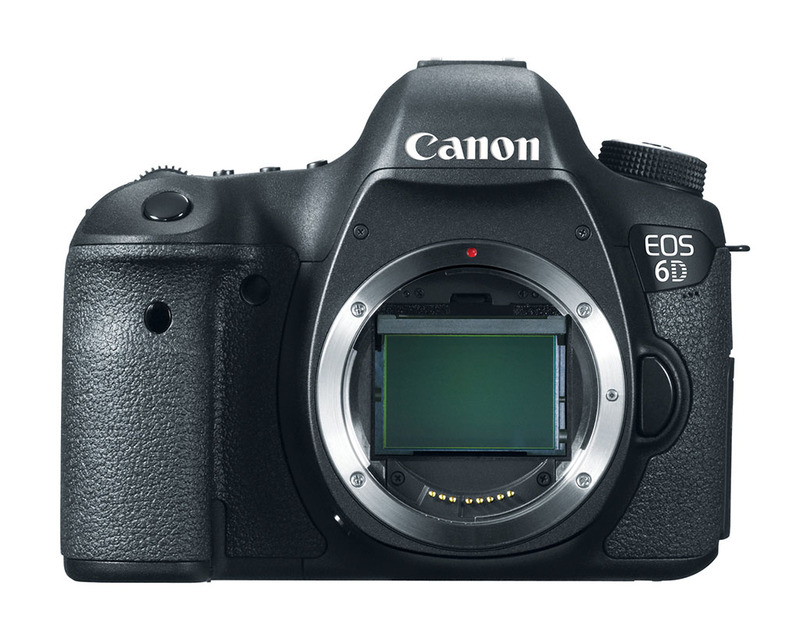 You can purchase the 6D new for $2,100, compared to $3,500 for the 5D Mark III. That's a substantial price difference. But you still might want to look at the feature comparison closely before making a final decision. You can create attractive portfolio pages and share them wirelessly with others around you -- all served securely from your digital camera. Sounds crazy, right? It isn't. Portfolio page served from an Olympus OM-D to an iPad mini using the Toshiba FlashAir memory card. In short, what I do is create the portfolio pages using Light Table in Aperture 3.4, then write those files to a Toshiba FlashAir Wireless SD Card ($55). After that, all I have to do is insert the card into my Olympus OM-D and turn on the camera. If I want to display this portfolio page on my iPad, or someone else's iPad, I have them log on to my FlashAir card and it will serve the page wirelessly to their device. If they want a copy of it, they can save the page to their Camera Roll. This is all made possible by the FlashAir card's ability to create its own secure web server. I talk about how this works on this week's podcast, Ingenious Toshiba FlashAir. Not only can this wireless-capable SD card share images from your camera to computers and mobile devices, it can actually serve web pages, PDFs, and other content. I created the portfolio page in Aperture 3.4 using the Light Table tool. Once the page was designed, I saved the Light Table as a PDF, then converted it to a JPEG to reduce file size. I created the Light Table in Aperture 3.4, then saved it as a PDF using the Print command. Once I have the JPEG version of the portfolio page, I copy it to the FlashAir SD card via drag and drop on my Mac. I then eject the card from the computer, insert it into my OM-D, and turn on the camera. I can share pictures on the camera, plus any additional files that I've added to the card. It's secured by WPA2 Personal security. So only those I give a password to can access the content on the FlashAir card. It's the perfect combination of geeky technical plus design using the elegant Light Table tool in Aperture. And best of all... it' easy! To learn more about Aperture, including how to build Light Tables, check out my Aperture 3.3 Essential Training (2012) on lynda.com. Also, take a look at our Aperture 3 Learning Center. Tons of free content about how to get the most out of Aperture. Top stories this week on The Digital Story: the ingenious Toshiba FlashAir wireless memory card, personal photo projects, and workshops update. Story #1 -If you've liked the idea of wireless photo transfer from your camera to the iPad, iPhone, or computer, but got fed up with the configuration hassles of using Eye-Fi cards or wonky built-in WiFi, then I have great news for you. The Toshiba FlashAir Wireless SD Card ($55) is easy to set up and it works with practically any camera or device. I've been testing the 8GB FlashAir with my Olympus OM-D, and I couldn't be happier with the results. Why is this technology better than what we've seen in the past? Toshiba has embedded a WiFi access point in the card. All you have to do is logon to the network with you iPhone, iPad, or computer, and you can grab your photos using a simple web browser or from a handful of apps designed for wireless transfer. Insert the card into your camera and turn on the power. After a few seconds, go to the WiFi settings on your computer or mobile device and choose the FlashAir card. Launch Olympus Image Share, and you should connect to your camera. At some point, you might want to create your own 8-character password by launching your web browser and typing in http://flashair/ This will log you on to the card and allow you to change its settings. It uses WPA2 Personal security. Limited to 8 GBs of camera storage. Performs best for me when I use Raw + SM Jpeg on the OM-D.
Bottom line. I've just left it in my OM-D, especially when I'm on the go and want easy file transfer. Story #2 - Personal Project - I'm a big fan of personal projects and encourage others to do them too. 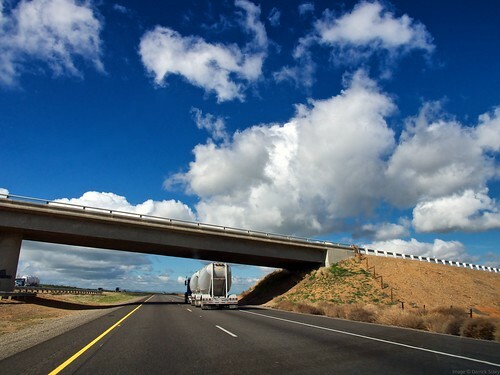 My current project is "Overpasses of I-5" that I wrote about recently on TDS. Even though we share these pictures with others in our community, the projects are designed for personal gratification. By focusing solely on a subject of interest to the photographer, we often try new things without worrying about what others will think. The upshot is often growth. Story #3 Workshop reservation forms for the current batch of listed workshops are going out this week. I'm also accepting applications for an advanced workshop on March 22-24, 2013 to cover the Artisan Cheese Festival in Petaluma, CA. This is an "Event Workshop" where photographers will work every aspect of the event with me and receive bylines for their published photos. Two spots are open, course fees are $250. Write me at derrick@thedigitalstory.com to apply. You can also download the podcast here (27 minutes). Or better yet, subscribe to the podcast in iTunes. You can support this podcast by purchasing the TDS iPhone App for only $2.99 from the Apple App Store. As I travel up and down the interior of California, I notice something different each trip. As the lighting shifts, colors change, and sky evolves, landmarks look different from day to day. One thing that remains constant are the solid, concrete overpasses that allow vehicles to traverse the Interstate without disruption. 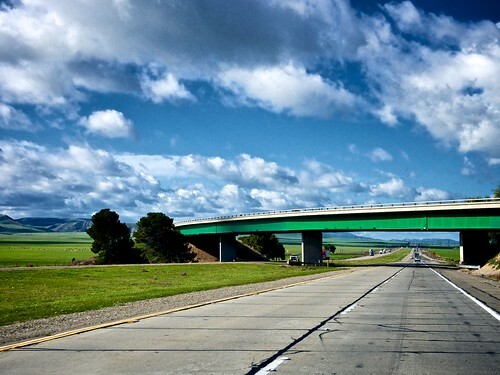 As a way to occupy myself during my 450 mile journey, I photograph the overpasses as I approach and pass through. 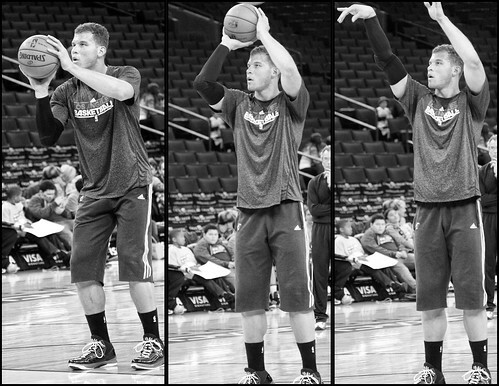 You may think that all of the shots would look the same. But they don't. And the simple designs of the overpasses complements a variety of landscapes and lighting conditions. I think these would make an interesting series of big prints, so you could feel their impressive bulk. Maybe dedicate a wall of the studio to a series. 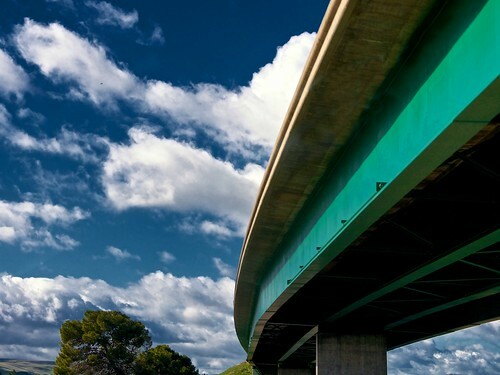 Some viewers would be intrigued by them, and others would ask, "Why do you take pictures of overpasses?" 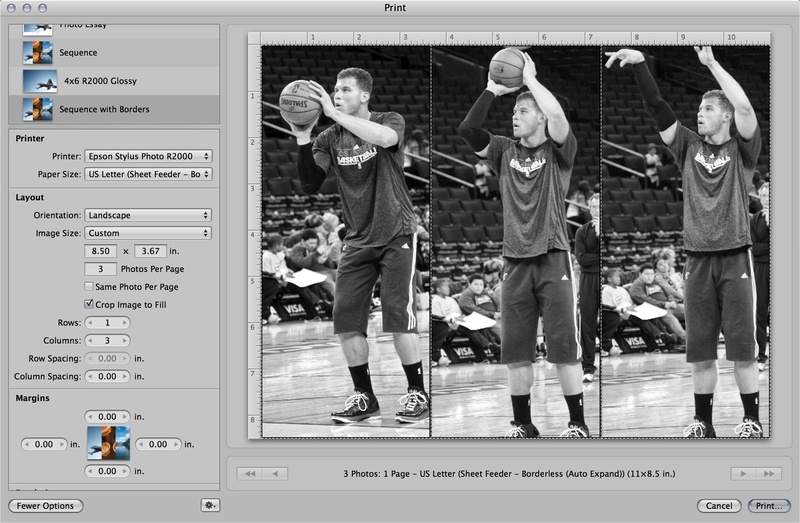 I created this photo sequence of Blake Griffin shooting a free throw using the "Sequence" preset in the print dialog for Aperture 3.4. It's an easy way to create these types of images. To create a sequence, select three photos in Aperture, then go to File > Print Images. When the print dialog box opens, select the "Sequence" preset. Your three photos will be placed as slices on a single sheet. You can fine tune their individual positions by clicking and dragging on each slice. Click the "More Options" button in the lower left corner to reveal controls to create borders, add slices, and more. Once you have the image to your liking, click the Print button. In the next dialog, click on the PDF button in the lower left corner. Choose "Open PDF in Preview." Here you can export the image as a Jpeg. The entire process just takes a minute or so, but the results are terrific!